All computers are members of the corp.contoso.com Active Directory Domain Services (AD DS) domain. 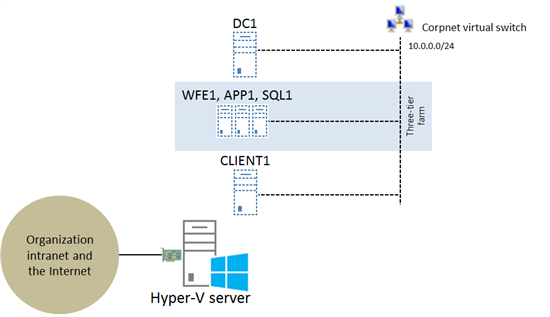 The following figure shows the SharePoint Server 2013 three-tier test lab. This figure shows the computers and their connections using a hub or switch. You can implement this configuration using physical computers and a switch, virtual computers and a switch, or a combination of physical and virtual components. All five computers (DC1, WFE1, APP1, SQL1, and CLIENT1) are virtual machines running on the Hyper-V server. The Corpnet subnet is implemented as the Corpnet virtual switch and all five computers are connected to it. The Hyper-V server has at least one physical network adapter that connects to your organization intranet and the Internet. You can use this connection to connect a computer to the real Internet to install software or updates. For more information, see How do I get my base configuration computers on the Internet? See the following for a short overview of the configuration process. Create a private virtual switch named Corpnet. For the steps to do this, see Creating a new virtual switch. Create a new virtual machine named DC1 that is connected to the Corpnet virtual switch. For the steps to do this, see Creating a new virtual machine. Create a new virtual machines named WFE1, APP1, SQL1, and CLIENT1 and connect them to the Corpnet virtual switch. 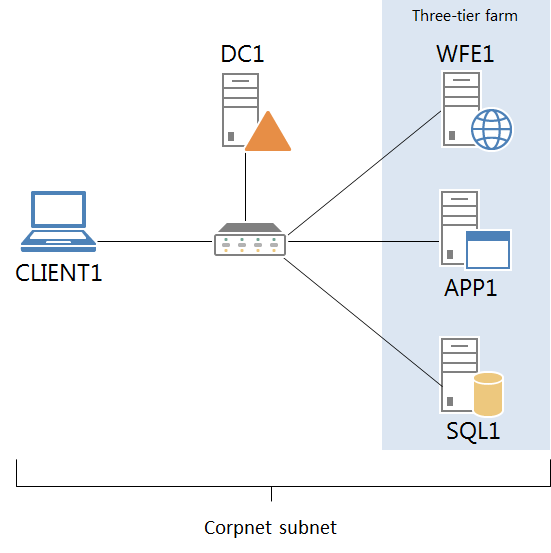 Follow the instructions in the Test Lab Guide: Configure SharePoint Server 2013 in a Three-Tier Farm. Step 1 installs and configures DC1, APP1, and CLIENT1. To install Windows Server 2012, Windows Server 2008 R2, Windows 8, or Windows 7 on a virtual machine, see Installing an operating system on a new virtual machine. Steps 2 and 3 configure SQL1 and install SQL Server on it. Step 4 installs SharePoint Server 2013 on APP1, creating a new farm that uses SQL1 as its database server. Steps 5 and 6 configure WFE1 and install SharePoint Server 2013, joining the farm created on APP1. The following Windows PowerShell cmdlet or cmdlets perform the same function as steps 1-3 of the preceding procedure. You must supply values for the –MemoryStartupBytes and -NewVHDSizeBytes parameters for each virtual machine. Enter each cmdlet on a single line, even though they may appear word-wrapped across several lines here because of formatting constraints. For additional information about configuring test labs with Windows Server 2012 Hyper-V, see Hosting Test Lab Guide environments in Windows Server 2012 Hyper-V.
For more information, see Test Lab Guides. For information about additional TLGs for SharePoint Server 2013, see SharePoint Server 2013 Test Lab. For the latest developments in the Test Lab Guides initiative, see the Microsoft Test Lab Guides blog.